So last night I let the dogs out for their evening constitution before heading to off bed. A normal practice around here. Mosely has taken to ranging a bit far to the south and has been finding “things” in the woods to eat, so I thought I’d keep a loose eye on him in an effort to keep him closer to home. When I stuck my head out the front door to see where he was, I noticed him a short distance off to the North…standing at attention and starting into the brush/woods. A sure sign something was there. Is it a moose? Is it a bear? Is it a porcupine? Any of which could make him act this way and none of which are good choices for a run in. All I could see were varying shades of green and brown amongst the shadows. I called to him to come and he let me know he wasn’t at all sure he was going to obey me or interact with whatever was out there. At the same time I called, they moved and so I saw them. A small herd of moose were browsing their way through the neighborhood. 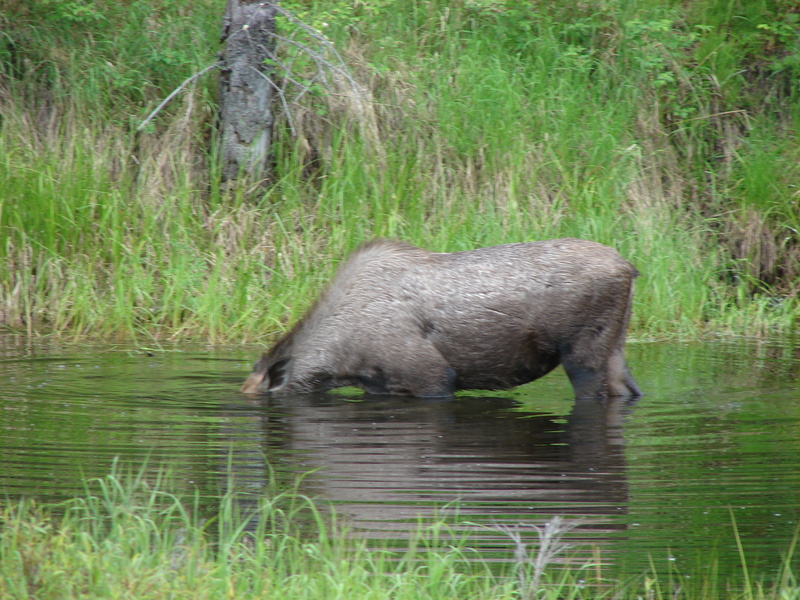 Moose usually travel alone or with their offspring, except for in the Fall, so this was a bit unusual. At any rate, one of the moose was clearly not liking his presence and had her head down, her ears back, and her hackles up. 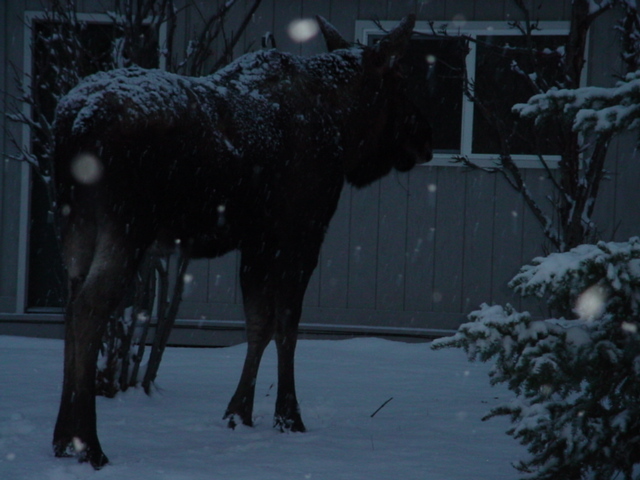 Now this is a moose you don’t want to mess with, so I called Mosely a second time and he came running. I am lucky that Misty and Mosely learned not to chase moose during our first winter here, 7 years ago. They chased a moose then, got chased in return, and led the thing right back to Aaron (age 3) and me. Whew! Nothing like being stuck in thigh deep snow while desperately trying to get out of the way and having a moose blow by you with about two feet to spare. High excitement in AK! Back to the original story. After getting Mosely inside, I ran in to grab my camera, but by the time I got back out there, they had moved on and were no longer in sight. I could hear them, but they had taken themselves deeper into the tall trees. 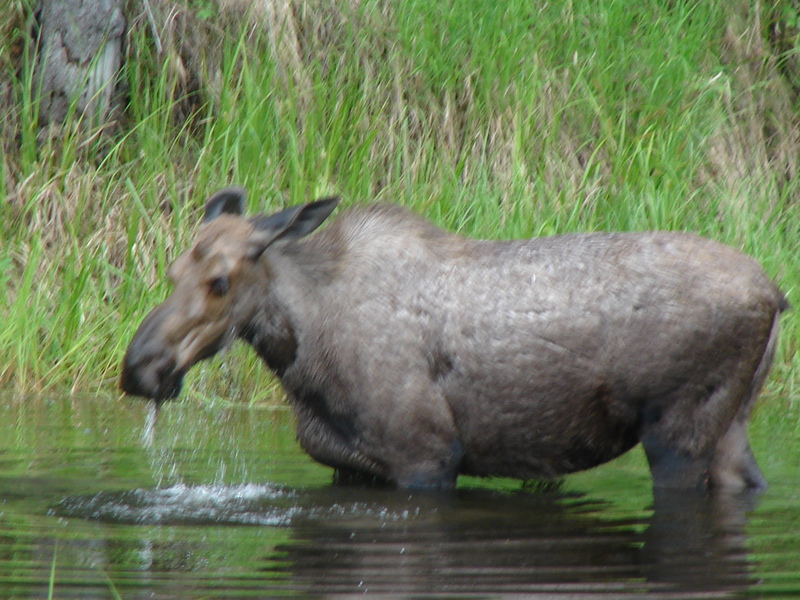 Since I don’t have shots of those particular moose, I have included a few I’ve taken over the years. Moose in the yard is certainly not unusual up here. Two of my friends currently have moose as regular visitors. They have their babies in backyards, they get into kiddie pools left in yards, and they seem to like sprinklers and swingsets too. I’ve even seen a photo of one up on someone’s porch looking in the window. Standing well over 6 ft tall at their shoulders and with heads as big as a child’s bicycle, they make for some fine encounters. 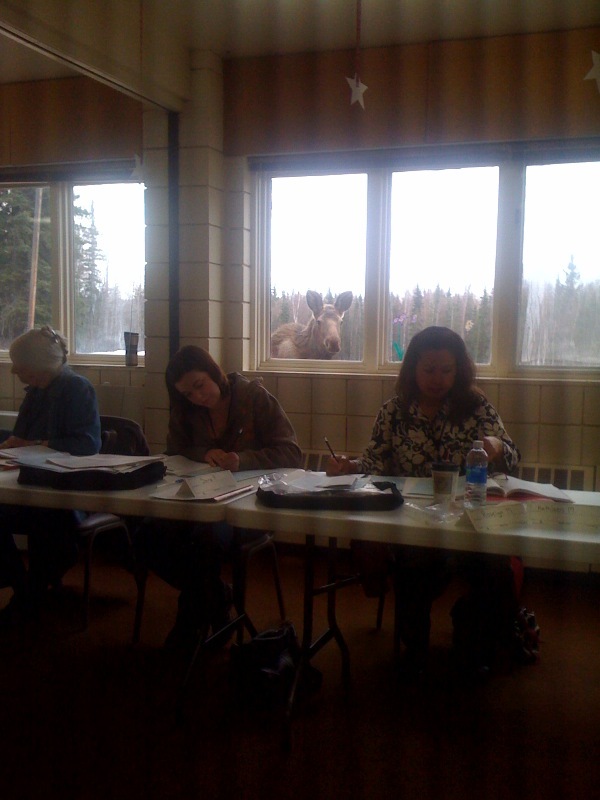 Be sure to check out the baby moose who visited my Census Training Class a month or so ago. He gave us the pleasure of his company for 15-20 minutes. Too cute. Glad the kids and you are OK.
LOVE IT!!! You are so good with words..This has got to be a book.!!! I need the first autographed one!!! Maybe I will get to see you this week.